Phurli Jhar falls is one of the worth visiting orissa waterfalls.Situated at a short distance of just 15km from Bhabanipatana in Kalahandi district Odisha,the Phurli Jharan falls casts a magical spell on the spectators.The cascading waterfall of Phuli Jharan comes down with full force from a height of 16 meters. this waterfall is very charming to the viewers as it splits the sun rays falling on it into rainbow colours.it is surrounded by evergreen forest which makes it an ideal spot for picnic. Located amidst the picturesque landscape,the Phurli Jharan waterfall offers the local citizens and the tourists with a wonderful opportunity to explore the natural scenic beauty of odisha.An ideal picnic spot,the waterfall is an important itinerary on the trip to Odisha. 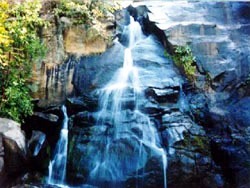 The trip to Phurli Jharan fall is full of excitement and thrill. The visitors can bath in the swift flowing water of the fall. The place has arrangements for preparing lip smacking and delicious dishes. Surrounded by luxuriant evergreen forests, Phurli Jharan provides the visitors with a unique scope to enjoy the heavenly bliss of Mother Nature.